Doppler Photo: Photos and stories by Omari Stephens: Go. 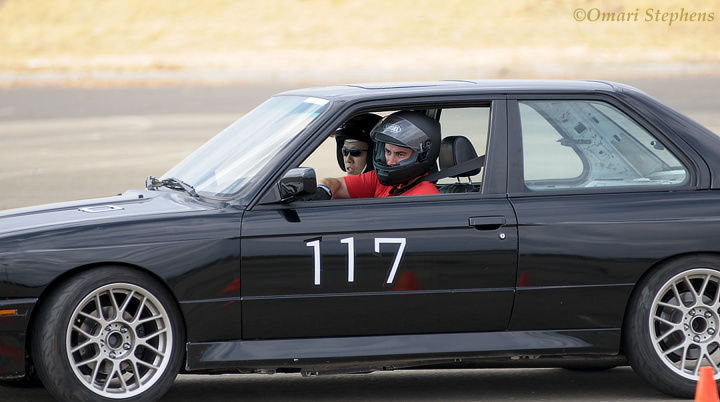 This past weekend was my second autocross, and my (sort of) second time shooting motorsports. 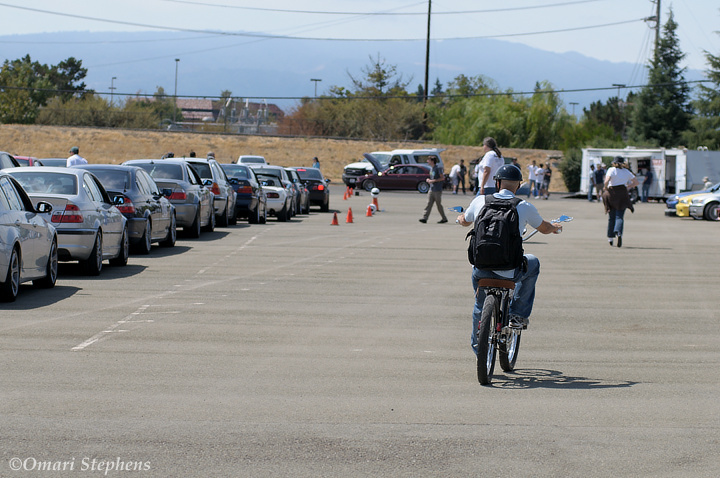 This time, it was held in an auxiliary parking lot at Great America, complete with undulating terrain, light poles, and a course that was only just starting to dry as the first run group was underway. The above is already one of my favorite car photos that I've ever taken. 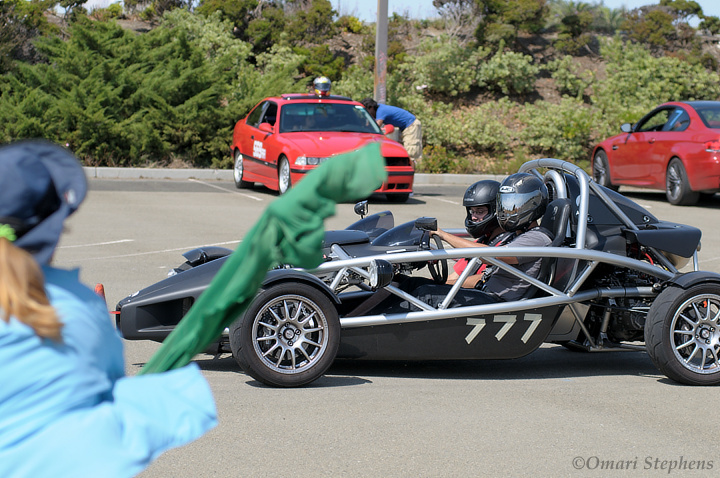 I really like the juxtaposition of the stopped car with the moving flag; the rigid, geometric structure of the Ariel Atom with the smooth, flowing contours of the green flag. It's neat that one of the goals of racing of any sort is to be like the flag: smooth, flowing from corner to corner, rolling on the throttle rather than stamping on the gas. Slow is fast. And perhaps it's a bit too fast. My friend Jason was one of the course designers for this first session at Great America. While test-driving the still-wet course, he wound up in third gear by the end of the long straight. He later summarized his discussion with the other designers as such: "We have to change this" (emphasis his). It was then that I realized that one aspect of designing an autocross course is trying to prevent drivers from shooting themselves in the foot too severely. If someone overcooks a corner, it's fine for them to take out a large helpin' of cones. It's not fine for them to slide off the track, hit a curb, and roll. 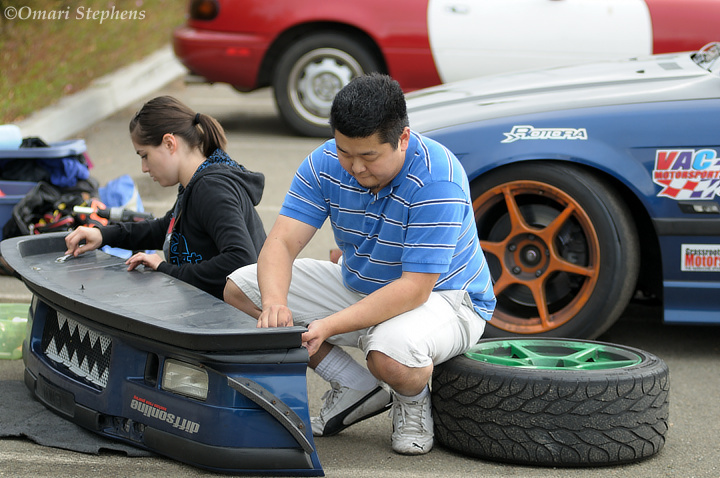 Another thing I realized was the extent to which the purpose of autocross is to spend time with and learn from other folks. A few folks had a pit "crew". Those that didn't helped and got help from each other. There were a number of friends and spouses who showed up just to watch, and for one driver it was a family affair: at one point, his young daughter looked on as he and his wife wrapped tire covers around the race wheels. 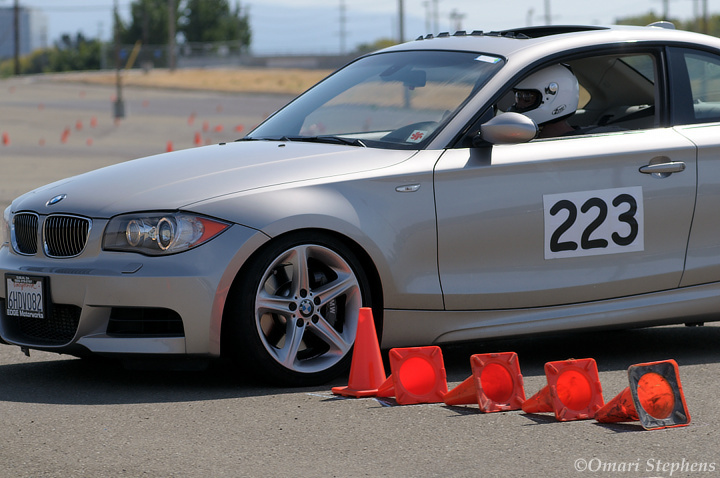 Of course, it's also an opportunity to spend time in your car and to learn about driving. As I mentioned in my last autocross post, ride-alongs happen all the time. For one, it's informative to have someone to give pointers here and there, and as a passenger it can be useful to see and feel how another driver navigates the course. But beyond that, teaching someone reinforces your own knowledge of a subject: driving coaches likely become better drivers as a result of coaching. I had another realization — more of an epiphany, really — which brings home something I had often heard but never truly noticed in the land of photojournalism. When you start to become part of a group and to acclimate to a new environment, your mental attitude changes. While as a documentarist, the desire to remain objective remains, an "objective view" must always have some standard of reference. Over time, that standard changes: many of the group's norms start to seem normal; what may have seemed weird at first is now old-hat. This biker sort of came as a welcome shock to my senses. In striving to learn to drive better, and to learn just how to be an autocrosser, I had lost sight of what it's like to see this microcommunity from the outside. And unavoidably so, I believe. It's difficult to maintain multiple competing points of view. In this photo, it can be easy to see an impermeable line of cars and inaccessible drivers, and it can be just as easy to see a line of friends, each honing his or her technique in an attempt to shave seconds off the clock. But it's hard to see it both ways. 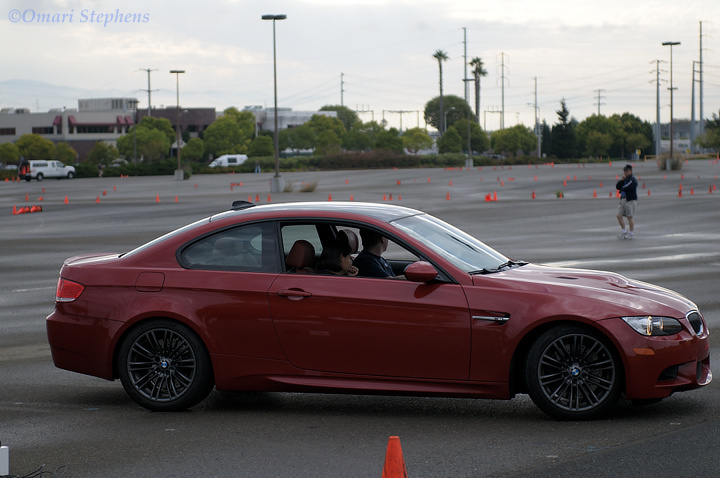 Even seeing how much my point of view has changed, though, I still enjoy autocross. It's challenging both from a driving and a photographic perspective. It emphasizes technique, which is true of most of the activities I like. It promotes awareness; tactile, aural, visual… sometimes even errant smells can provide useful information. But most of all, it's all about relationships: how close can you get to that cone? How quickly can you find some folks to help you fix your water pump? How fast can you fly down that straightaway without butchering the corner? How much can you learn from another driver?